Any electric pumps, solenoids, motorised valves, etc can be used. Single or 3 Phase (via optional connection kit), Rainforce does not need to ‘know’ the pumps it uses. Optional hardware allows pumps of any power up to the limit of your electrical supply. Pumps can be replaced with other makes and models at any time and don’t need to be matched. Downtime due to reprogramming or lead times for a specific pump are eliminated. Rainforce incorporates Advanced Fault Tracking. Fault codes are stored in memory until you choose to erase them allowing easy identification of intermittent and historical faults. Clever design of the circuit board makes Rainforce the most robust unit on the market today, with overvoltage and brownout protection, immediate recovery from power failures with no loss of setting and auto reboot, individually fused outputs, oversized power supply to electronics, removable MCU chip (software) for easy upgrades, automatic failover of pumps, and automatic search for spare pumps even if not configured for twin pump use. 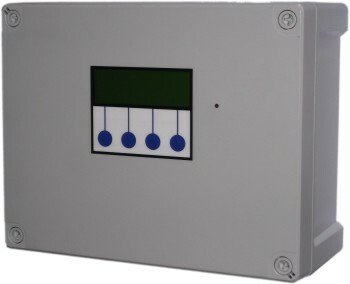 Modular connector design and tolerant software allows pumps to be ‘hot-swapped’ without switching off the controller or remaining pump. Adjustable pressure control (10bar max). Duty Standby/Duty Assist with alternation. Solenoid valve isolation on fault – reducing fire risk from overheat. Single phase (3 phase via connection kit). Pump cut-in/cut-out pressure (for each pump). Pump Mode (Pump1,Pump2,Twin pump assist/standby). Minimum Rainwater Level (dry run prevention). Designed for UK type rainwater systems – no requirement for additional booster pumps or other modifications commonly needed with continental systems. Modular design allows extremely rapid swap-out of parts. Including hot-swap of pumps, solenoid and sensors (no power-off). Also no need to match replacement pumps or solenoids.